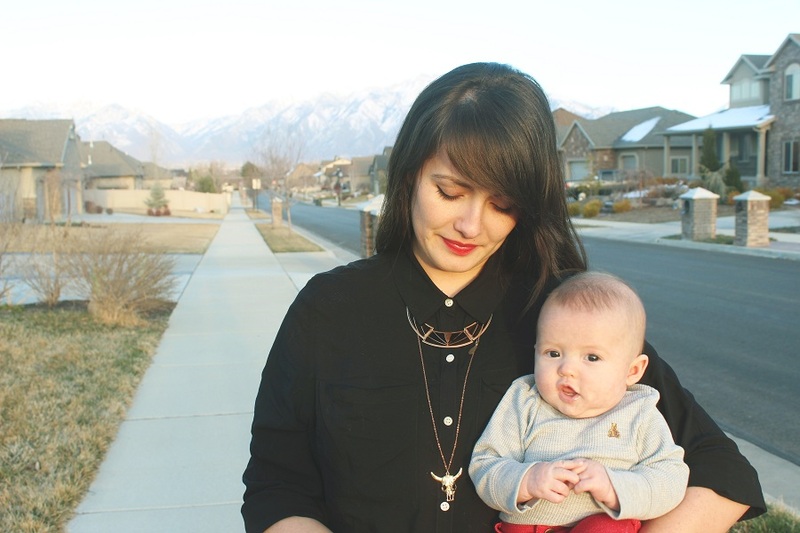 I haven't done an outfit post in a while and decided the weather has warmed up enough to start including Zaden in my outfit posts. This will be the first of many mama-baby style posts (; We wore these outfits when we went to Olive Garden to celebrate my brother-in-laws birthday towards the end of March. I have been wearing these boots so much lately and I have been putting Zaden in these little shoes from Baby Gap as much as possible. I didn't realize how well both our shoes go together until I was editing these pictures. 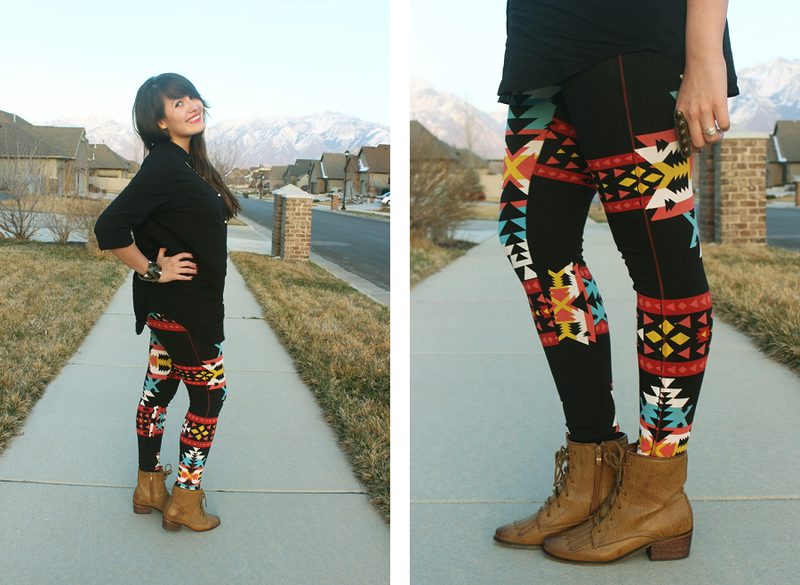 Style Lately recently sent me these fun aztec print leggings and it's honestly hard not to wear them everyday. They are so dang comfortable and are perfect for lounging around the house or making a quick trip to the supermarket. Normally I wouldn't recommend paying more than $20 for a pair of leggings but these are a much higher quality than any of the ones I own from Forever 21 or H&M. They are currently out of stock but I'm sure they will be getting more anytime in the next couple of weeks. Zaden is looking cuter than ever!! Love to see you back blogging! oh I just bought those leggings! Love them so much! he's such a sherman in that last one though, seriously. you look so cute in these photos! gorgeous hair and outfit. love it all! Ah you guys match! I love it! Your hair looks so fab too! loving your aztec print pants. And the baby is super adorable ! you and your little look so cute! love the leggings! love the leggings. glad to see you back! and he's looking handsome! Oh my gosh, he is getting so big! What an adorable and handsome little guy! Also, those leggings are amazing - they look super cozy! now this is one little stylish guy!! You guys are just so cute! And he has gotten so big! I really like it, thanks for the advise! I just started writing a blog, would you like to follow each other? follow me and I'll follow you back! great blog! awww you two are beautiful! i really oved this post. the print on those pants is great, happy to say Ive never seen them on anyone else before. your little one has grown so much! I'm so amazed buy that beautiful backdrop of mountains you have year round! Lucky you! 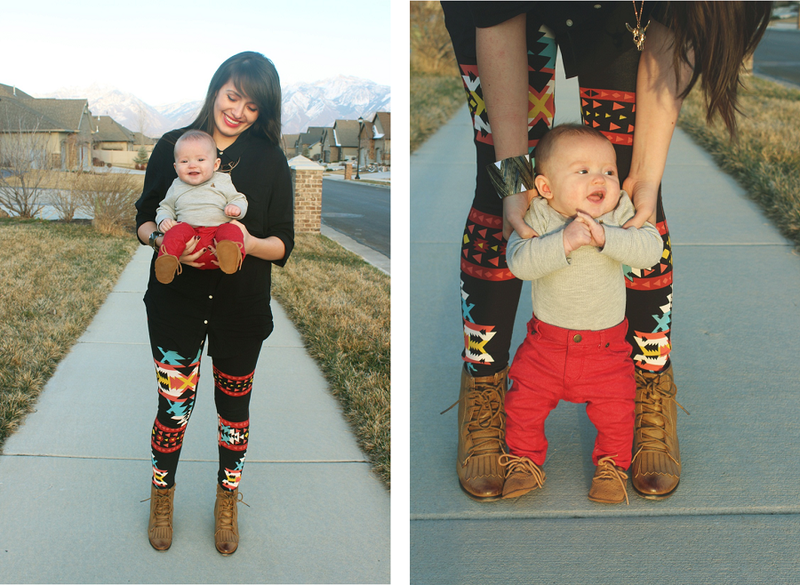 Too cute :) LOVE the leggings, and of course your baby is so delicious! Love the leggings! I've seen a lot of that Aztec print, some done well and some done poorly... but you're rockin' it! Mauwwwww! How adorable! 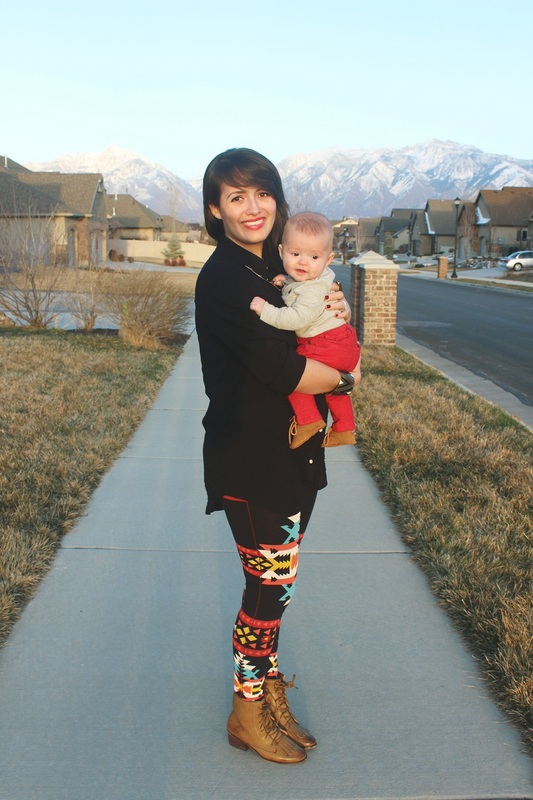 I love your Aztec leggings. 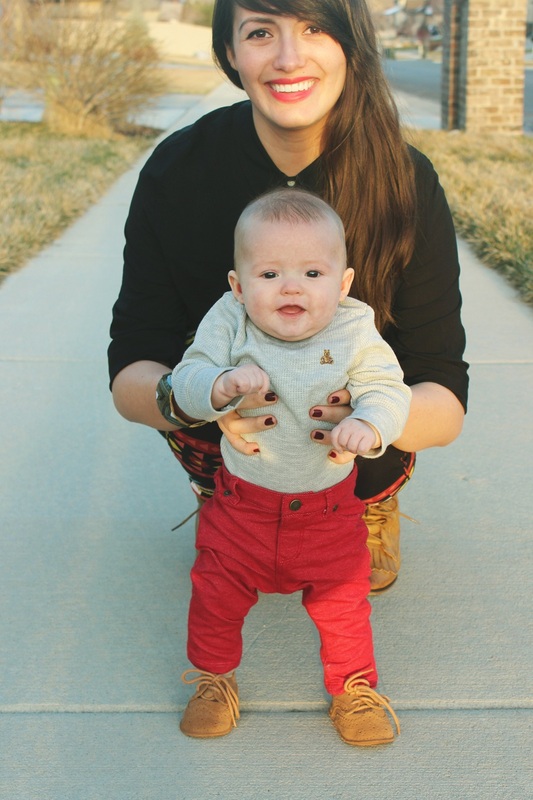 Zaden is such a little cutie pie..... and I love that your outfits match. What cute pics! I found your blog through a frend and I absolutley love it! Consider me your newest follower :) If you have a chance check out my budding blog, Slightly Strange. I would love new followers and any and all advice you can give me! Loved the photos of Zaden. Great way to remember what he was doing each week. Babies grow up way too fast! Enjoy each moment.